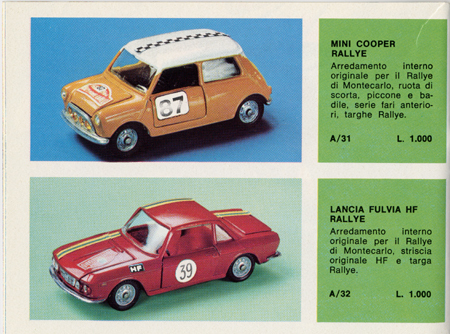 This catalog contains only one Hot Wheels Gran Toros, the Abarth 695ss, Model #6608. 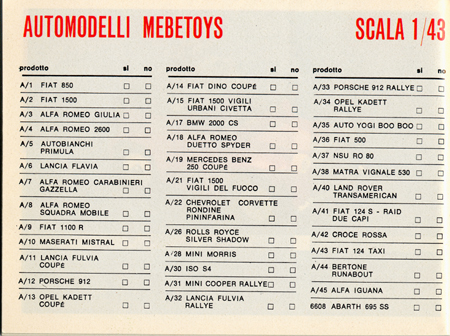 Note that all the Mebetoys models have alfa-numeric model numbers (for example, A/36). 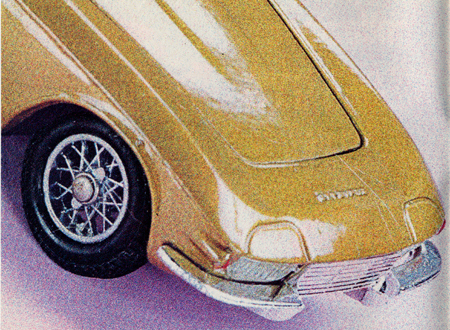 of the Chevrolet Corvette Rodine. 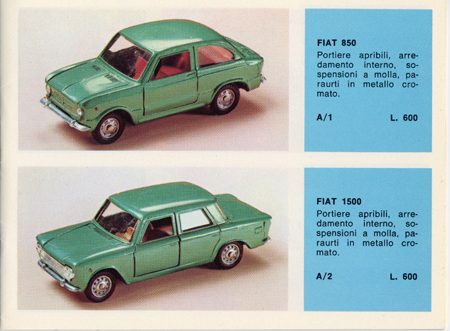 The Fiat 850, Mebetoys Model # A-1 and Fiat 1500, Mebetoys Model # A-2. 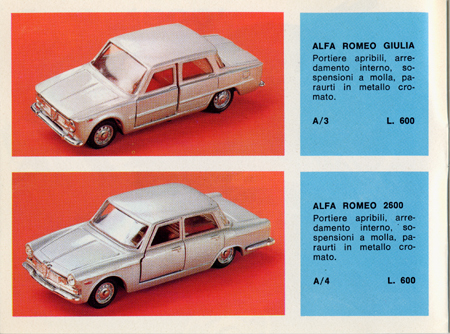 The Alfa Romeo Giulia, Mebetoys Model # A-3 and the Alfa Romeo 2600, Mebetoys Model #A-4. 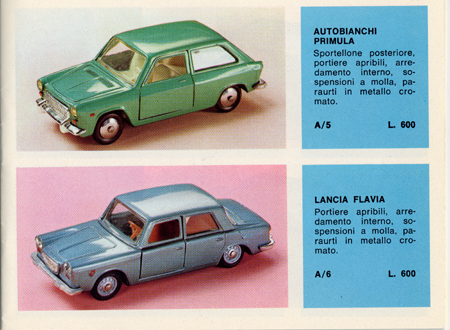 The Autobianchi Primula, Mebetoys Model # A-5 and the Lancia Flavia, Mebetoys Model # A-6. 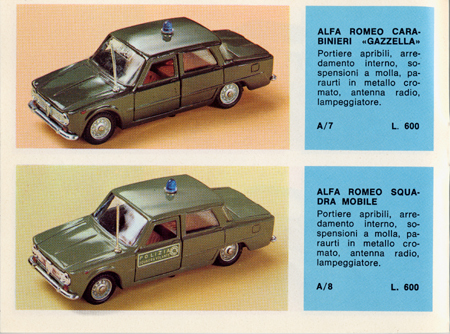 The Alfa Romeo Carabinieri "Gazzella, Mebetoys Model #A-7 and the Alfa Romeo Squadra Mobile, Mebetoys Model # A-8. 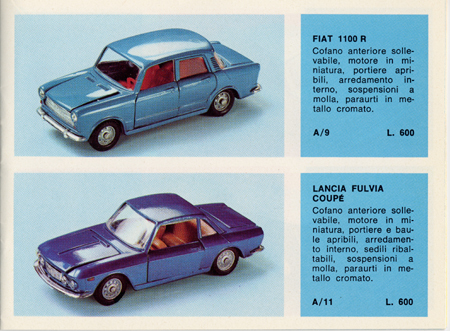 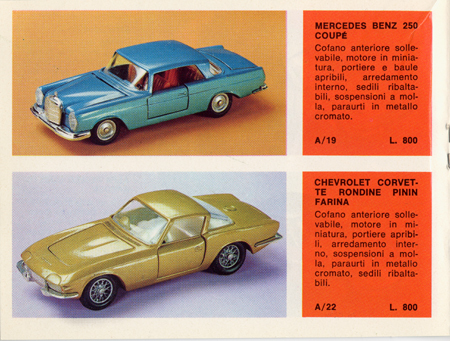 The Fiat 1100R, Mebetoys Model # A-9 and the Lancia Fulvia Coupe, Mebetoys Model # A-11. 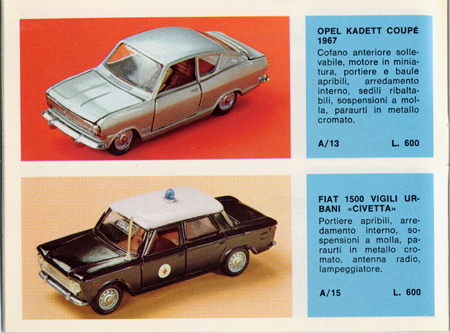 The Opel Kadett Coupe, Mebetoys Model # A-13 and the Fiat 1500 Vigili Urbani "Civetta" Mebetoys Model # A-15. 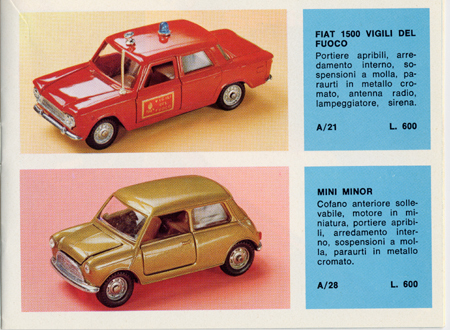 The Fiat 1500 Vigili Del Fuoco, Mebetoys Model # A-21 and Mini Minor, Mebetoys Model # A-28. 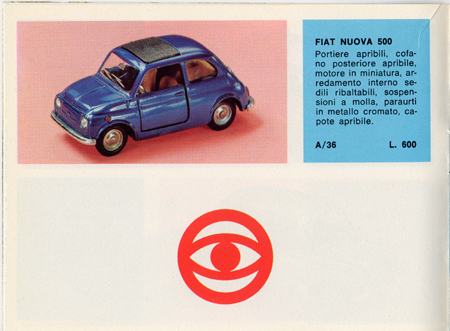 The Fiat Nuova 500, Mebetoys Model # A-36. 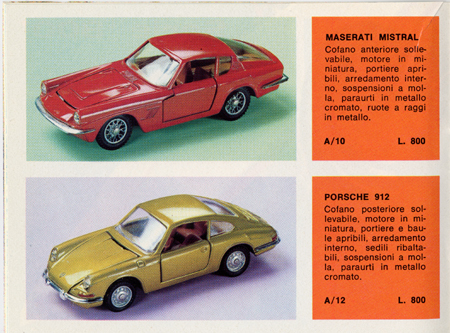 The Maserati Mistral, Mebetoys Model # A-10 and the Porsche 912, Mebetoys Model # A-12. 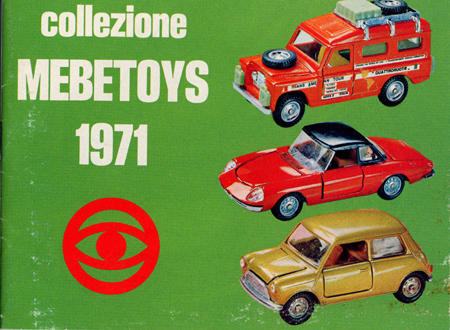 The BMW 2002 CS, Mebetoys Model # A-17 and the Alfa Romeo Duetto Spyder, Mebetoys Model # A-18. 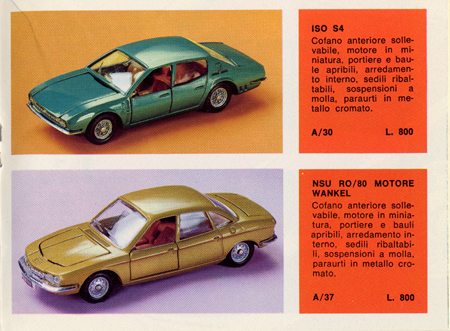 The ISO S4, Mebetoys Model # A-30 and the NSU RO/80 Motore Wankel, Mebetoys Model A-37. 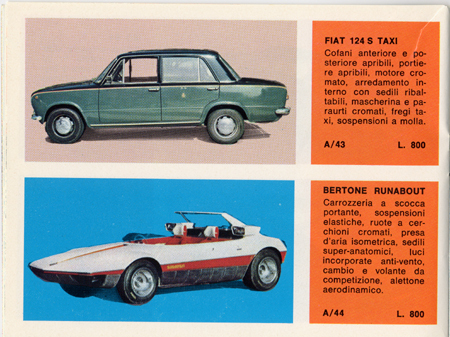 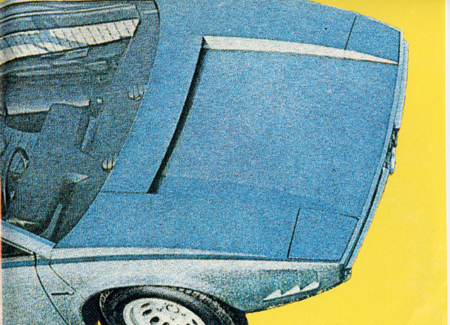 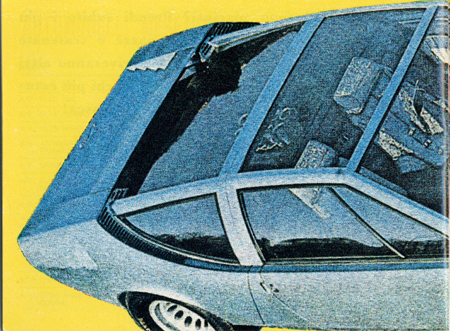 # A-43 and the Bertone Runabout, Mebetoys Model # A-44. 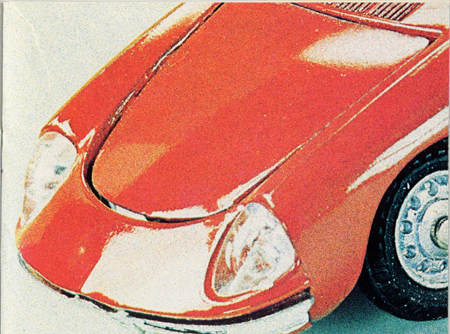 A close-up of the Alfa Romeo Duetto Spyder. 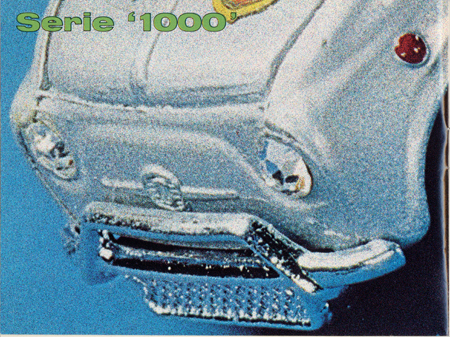 The Serie '1000' introduction page. 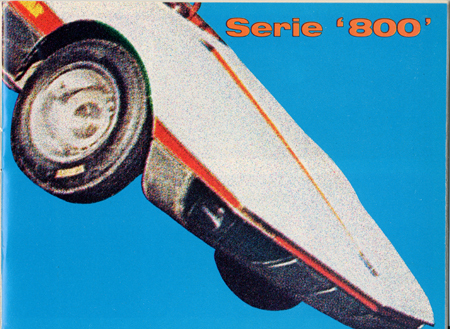 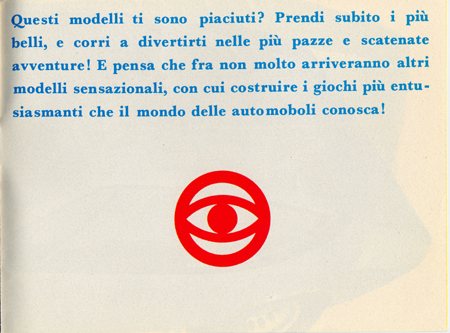 This is a closeup of the only Gran Toros in the catalog, the Abarth 695ss. 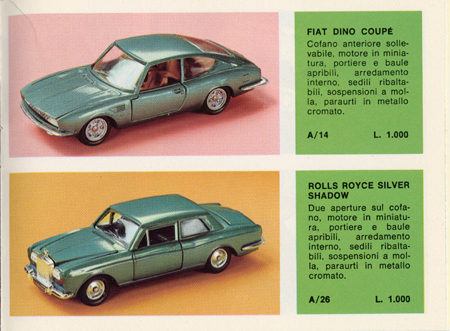 The Fiat Dino Coupe, Mebetoys Model # A-14 and the Rolls Royce Silver Shadow, Mebetoys Model # A-26. 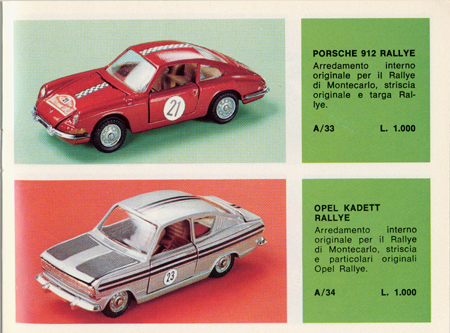 The Porsche 912 Rallye Mebetoys Model # A-33 and the Opel Kadett Rallye Mebetoys Model # A-34. 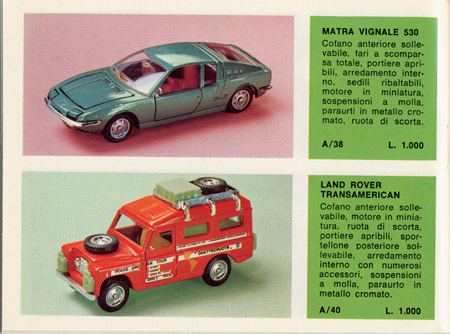 The Matra Vignale Mebetoys Model # A-38, and the Land Rover Transamerican, Mebetoys Model # A-40. 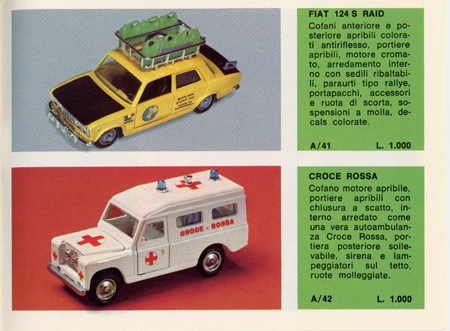 The Fiat 124 S Raid Mebetoys Model # A-41 and the Croce Rossa, Mebetoys Model # A/42. 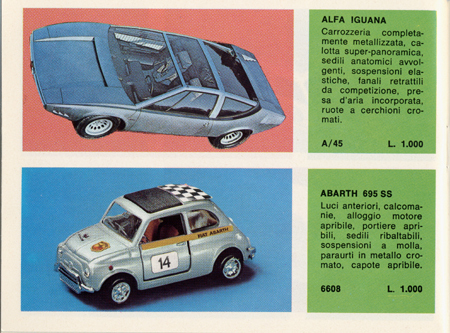 The Alfa Iguana Mebetoys Model # A-45 and the Gran Toros Abarth 695 ss, Model # 6608. 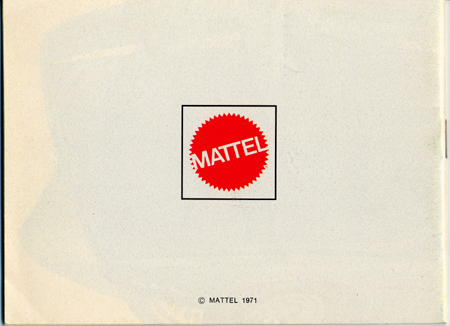 Note that this is the only numeric model number in the catalog. 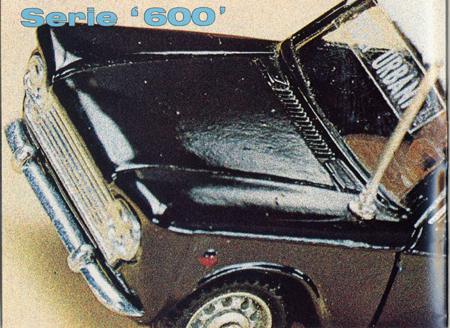 This number format (6608) is consistent with the Gran Toros numbering syetem. 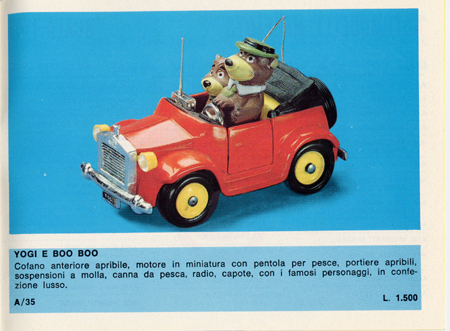 The Yogi e Boo Boo, Mebetoys Model # A-35. 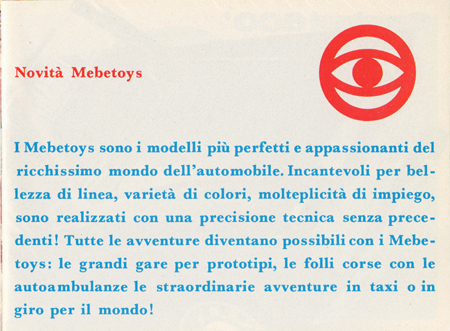 A close-up of the Alfa Iguana Mebetoys Model # A-45.